The 4th of July is one of my favorite holidays, I love spending time with my family and making time to just enjoy summer. I think this is probably true for most people, but there is more to this holiday than barbecues and fireworks, it's about pride and love for our country - Patriotism. There is something about the 4th of July that makes us all feel united in celebrating together, no matter what state we are from, what age we are, or what we look like. Notice flags - in your neighborhood, on television, and at the store. Then take time to talk about all of these flags, why do people fly them in their yards and wear them on their clothes. Say the Pledge of Allegiance - practice the pledge together and then talk about why we say a pledge, what does it mean? This Pledge of Allegiance Printable is adorable! Fly a flag at your home - If you have a flag pole talk about the rules associated with flying the flag (it shouldn't be flown during rain showers unless it is illuminated, etc. - this website lists all flag etiquette rules), if you do not have a flag pole brainstorm a creative way to display the flag at your home, such as a door or wall hanging, or a paper version for the refrigerator. This pinboard has a ton of great ideas for patriotic crafts! Volunteer - does your community display flags or special banners for the 4th? volunteer to help place or hang them, it will be fun for the entire family. 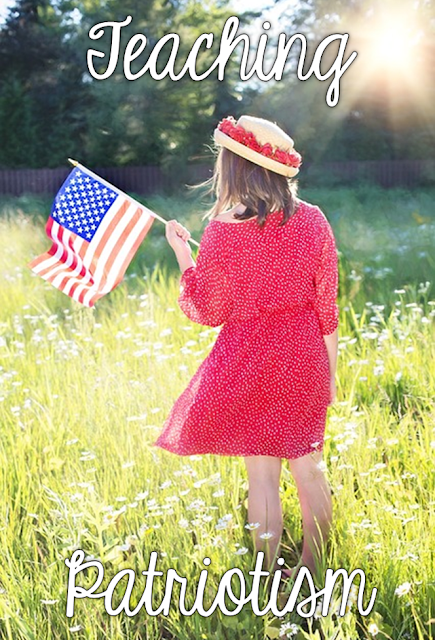 Make a patriotic playlist - Music has a way of making me feel patriotic, one of my favorite things to do on the 4th is to listen to our local country station, they play patriotic songs all day long. You can make your own playlist for the day, add your favorite version of the star spangled banner and check out this list for more inspiration. All of these activities make patriotism (and the 4th of July) a lot of fun, you might even start some new traditions!